…finding one’s paper can be such a trial, and such a thrill once found! We all thank you for the recommendation. Your watery reflections shout ‘summer!’. Thanks for your feedback as always, Lance! It was the most fun I’ve had painting in sometime. No pressure to make something look a certain way…..just trying to convey a feeling. Thank you, Rebecca, and what a compliment…..an area I’ve always wanted to visit. Your beautiful country is on my Bucket List! Haha, that’s good to hear. I don’t suppose you’ll be disappointed! When the sun does shine it’s wonderful though, and we appreciate it all the more. Peaceful tranquil refreshing beauty in nature is what came to mind before I read your entire post. Honest! Then I read you felt refreshed and at peace. That is exactly what I felt! Wow! And now I must look into that paper. I’m loving learning from you and your passionate art quest!!! I’m so glad this is what you experienced, my friend! :)))) This was so much fun to do. And what a nice way to track progress, too, in little books. 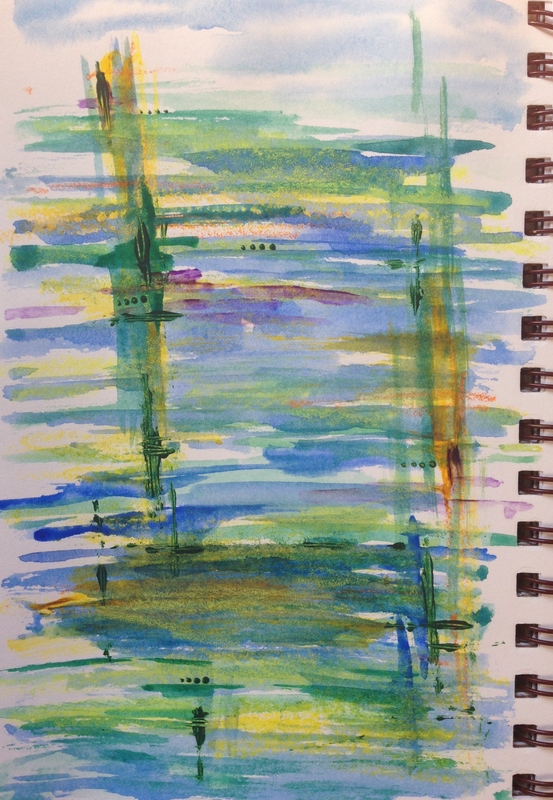 It’s not better for watercolor than Arches, but it is wonderful for a journal that you’ll want to have lots of flexibility with as to mediums. Wonderful, Kathy! Thank you. All we need is the binos! Your image says “cabin hidden in the woods” to me. By a lake. How did you place that image in my mind. I want to do more experimenting, like you. How do you do it? Just pick up a brush and choose a color and…start? I’m so glad; what a wonderful image to evoke in someone’s mind. To answer your question: yes. I usually start with a feeling of some kind, or a place in my mind that evokes feelings for me and two colors that I think go together well. As I start making marks on the page, the painting starts talking back to me and it tells me what comes next. Sometimes the key is knowing when to stop. One video I watched said to stop when you feel that adding something else will no longer make the piece better. Sounds obvious, but it surprisingly isn’t. For me, anyway. It’s so much fun, Kirk, and I think you’d really enjoy it. Thanks, Laura. I’m going to try this. I think I can start with a feeling and a color.I do know what it is like to have the image talk back to me. Courage! Gosh, Kirk. So interesting what takes courage to different people. Drawing random strangers, now that takes courage! I have now tried this twice. If you do two abstract paintings, I will try it again. Deal? Oh, it would make me so happy if you tried this! Deal!. And I’ll commit do doing them this week. I’ve got Monday’s image queued up already. Be prepared: whatever I produce will most certainly look childish and juvenile..
*eye roll* you mean like my sketches of random strangers?! And no it won’t. It’ll be totally cool, and a whole new branch for you to explore (if you enjoy doing it)! Thanks for your feedback, Charlie! I think that’s awesome! I love your interpretation. I’m really glad you enjoyed this! Also good luck tomorrow at the vet. Nice reflections. Also one of my favorite papers. I am currently working in their mixed media 7.5 x 9.5 inches. It costs a little more, has a soft dark brown cover without the spiral binding. It will open flat for you so you can do a double page spread. I have those too, Carmel – started with them, because I didn’t think I’d like the spiral as a left-handed person. Very odd that I prefer the spiral! I’m glad you’re loving that paper too! Reminds me of a shimmering Shantung silk dress I haven’t seen for a long time….water and bamboo leaves in the design. Lovely effect. I really like this image. It’s beautiful. To me it feels like little seaside town on a rainy summer day. Kind of remote but peaceful at the same time. Thank you, I’m so glad it evoked that for you. It was so much fun to do. Thanks, Ann! I was wondering what you would think! Do you enjoy doing abstract work? And I enjoyed hearing that the Strathmore Mixed Media journal is the 500 series! Very cool! I purchased some watercolor paper that is in a tablet of the 400 series and absolutely love it. It doesn’t buckle like my 140 LB Arches paper. I’d bought one of these at our local art store before I saw your previous post about them. I’ve not started using it yet, but I think I will after I’ve filled up my current sketch book…or I may just give up on my current sketch book and save it for times when I’m out and will only use graphite on it. Multimedia sketch books are so much more versatile! Bah! I was hoping you’d feel like you’d been to the beach! :)) Oh, i do hope you love that book as I do. What amazing paper and it’s just the perfect size. I just love that it waits for me at the end of the day and everything in there is dated and sequential. It’s so much better than any diary I ever tried to keep. A real delight! This reminded me of a lake I used to visit as a teenager with my family. I liked to stand at the edge and watch the ripples in the water at sunset. Thanks for the memory! I will have to try the Strathmore journal. You’re so welcome, and I’m so glad it brought up a wonderful memory for you! Meditative. The sort of trance like feeling one can slip into while staring at the gentle movement of water and the light as it dances across the surface. That is what came to mind looking at your lovely piece of art. Thank you for the mixed media journal suggestion, always on the look out for sketch/doodle books to have fun with. Thank you! That’s almost the way I felt while painting it. I’m so glad you enjoyed it. Those journals are so great! Thanks Debi! Isn’t it amazing how painting can be like a mini-vacation? Love it! This is awesome! Since you’ve praised Strathmore so much, I’m now itching to try it as well, but I’d have to check first if we have that here in the PH (sad no?) So far, the only premium sketchbook/pad here is Moleskin but it’s just too pricey (one can easily fetch $20). I’m settling with Canson (student-grade) for now but it buckles a lot. The painting has a soothing effect; like looking into a pond’s reflection and something you’d love to stare at if you’re in deep contemplation. Thanks for your review of the journal and paper! Always nice to hear from other painters what they do and don’t like and why! I can see why you love that paper – I have a small and a large journal like that.The paper is really heavy and will indeed take all kinds of media. For me they were a little more expensive, though, so I feel hesitant in using them. As for your painting – it reminds me of when I was a teenager and walking along a lake near my home , looking across it to an island, or just sitting and looking at the rippling and pondering something. ( I find I am not the only one, looking at the other comments). This is a good, peaceful memory for me. Looking forward to seeing more of this kind of work from you! I love this! Underwater scene but abstract, and the choice of colors are among my favorites together. Lovely loose lily pond scene – that’s how I see it and I do like the easy flow to the piece. Thanks for the tip of the Strathmore paper – I been thinking of doing a bit of Notan drawing to open some avenues of creativity and this would be perfect. Have a wonderful week Laura! I looked that up; interesting, Mary. I’ll be curious how you get on with it. I’m glad you enjoyed this painting. I did another one last night and they are so refreshing to do. I’m looking to drive a bit more creativity into my work and I think this will help me explore beyond what I see in front of me. Nice, Mary! Boy I hope that all the practice gets me to your level at some point. You really inspire me! Wow Laura thank you. Many a day I feel like I’m still at the starting gate, with something new to learn everyday You are moving right along, my impression is that watercolors are a bit difficult to master – I’m inspired by your progress and diligence at the medium. Thanks, Mary. I don’t have the patience, it seems. This is why I keep going in other directions too. I was curious what you were doing your watercolor work on. I had a Multi-Media sketchbook that I was doing prisma color markers and ink sketches on, but can’t find it anywhere. I remember being happy that I could use the fat tipped permanent marker on it and it not bleed through (it’s the simple things in life really lol). This painting reminds me of a slight breeze over the surface of a lake. Aw, thanks Jesse! I think you’d love the Strathmore Mixed Media series. I always use both sides and I never have any trouble! I’ve thrown lots of stuff at those journals too. I’ve just started on my third one, and I’m sold on them. Also, they’re pretty inexpensive. What’s not to like?? I hope you like them too. I’ll definitely be investing in one soon. I’d love it Jesse! I’ll add that to my to do list lol.